Ancient Greeks believed that gold was formed by the rays of the sun transforming common metals in the earth. Scientists today still think that gold formation is related to stars, specifically dying stars. At the core of a dying star - a supernova - elements begin to fuse together in the extreme heat. Clouds of heavy elements are ejected that can eventually form new stars and planets like Earth. A small amount of this material is gold and over millions of years it dissolved and accumulated under the intense heat of the earth's mantle. The Great Dividing Range was noted by early geologists to be similar to gold-bearing mountain ranges like the Urals in Russia and the Rocky Mountains in America. The specks, flakes and nuggets that caught the eyes of early gold seekers in Victoria and New South Wales confirmed the similarity. Lang, JD 1852, The Australian Emigrant's Manual, or A Guide to the Gold Colonies of New South Wales and Port Phillip, Partridge and Oakey, London. This quote is taken from a digitised pamphlet. Almost 10,000 pamphlets (and counting) have been digitised and are available as PDFs in the State Library of Victoria's catalogue. The new science of geology was beginning to put much longer estimates on how much time it would take to form a chain of mountains like the Great Dividing Range. These theories pointed to a far older Earth. Geologists speculated that gold formed in the intense heat of volcanoes and that Victoria's streams and rivers washed out gold from greater supplies trapped underground. Hearing these theories caused many to believe that there was a mother lode somewhere deep in the mountains. [T]hey had established a connection between reef gold visible in a quartz outcrop at the head of a gully and deposits of gold dust and nuggets downstream. The process of erosion had sloughed fragments of gold from the reef into the gully. Robyn Annear's Nothing but gold is a fascinating account of one of the most disruptive years of Victoria's history. Much of her research was conducted using the resources and collections of the State Library of Victoria. Trial and error - and discoveries by explorers, shepherds and Indigenous Australians - led to a series of rushes that often followed the course of Victorian rivers. Ballarat and Bendigo would become two of the richest fields the world had seen, possessing both alluvial deposits and deeper leads. 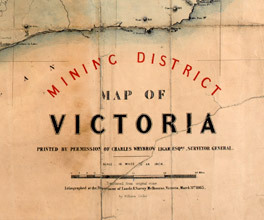 Victoria would eventually be divided into seven mining districts: Ararat, Ballarat, Beechworth, Maryborough, Castlemaine, Gippsland and Sandhurst. Tracks quickly became roads and inns became towns. Some fields became home to thousands in just a few days and were deserted just as quickly when the easy gold ran out or when news of a richer strike reached the diggers. While speculation about a 'mother lode' was based more on wishful thinking than geology, the hidden wealth of Victoria would begin a series of events that would transform the new colony.